Eurovudas Pisa Log Cabin: The Eurovudas Pisa log cabin offers a generous 27.1m/sq living area in its 4.8m by 5.8m footprint. With windowed double doors and two double windows on the side, this log cabin lets in plenty of natural light, and offers control over ventilation in hot weather. Its double interlocking tongue and groove wall logs are 44mm thick, which provides plenty of heat retention and creates a quiet and cosy interior. All windows and doors are double glazed, and have a double rubber gasket. Roof and floor boards are 19mm tongue and groove, and the roof can be further protected with optional shed felt roofing material and bitumen felt shingles to ensure proper protection from the elements (note that without these the roof is not waterproof). 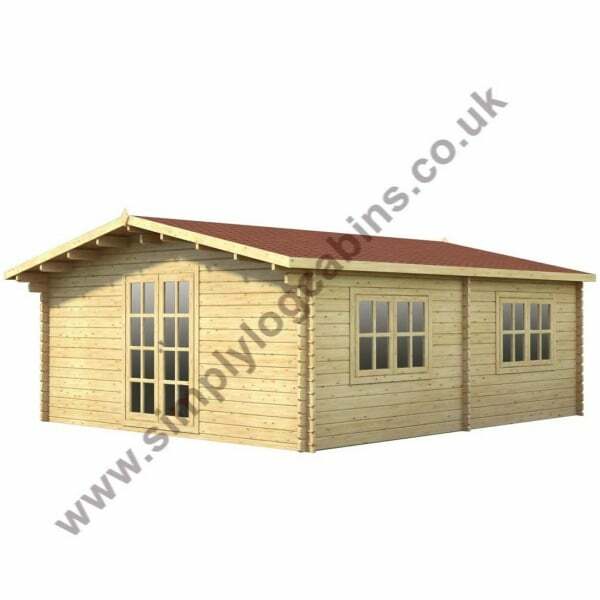 A very spacious and attractive looking log cabin, the Pisa is sure to provide years of use and exceptional functionality. The traditional North European Spruce construction style of this cabin creates an easy to assemble and extremely sturdy structure. The Eurovudas range also feature chalet corner jointing to give that extra timber jointing for extremely good weather resistance.